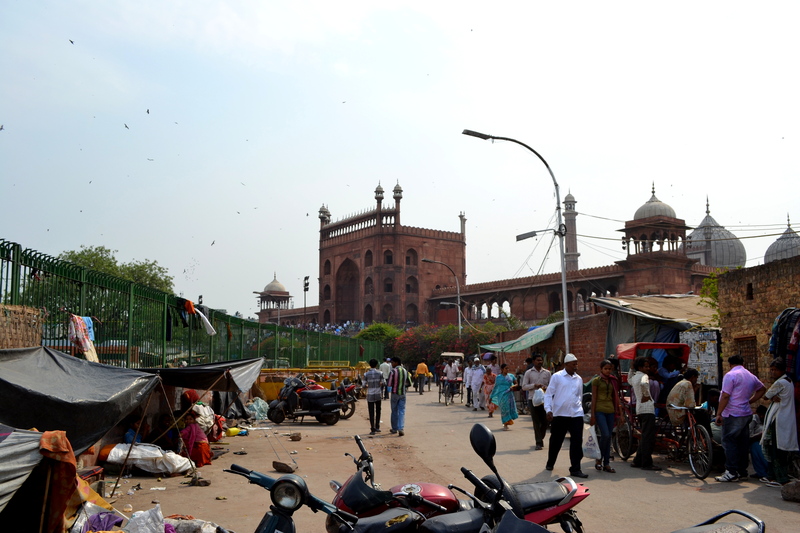 We take an auto-rickshaw into Old Delhi, to the Jama Masjid, the largest mosque in all of India. 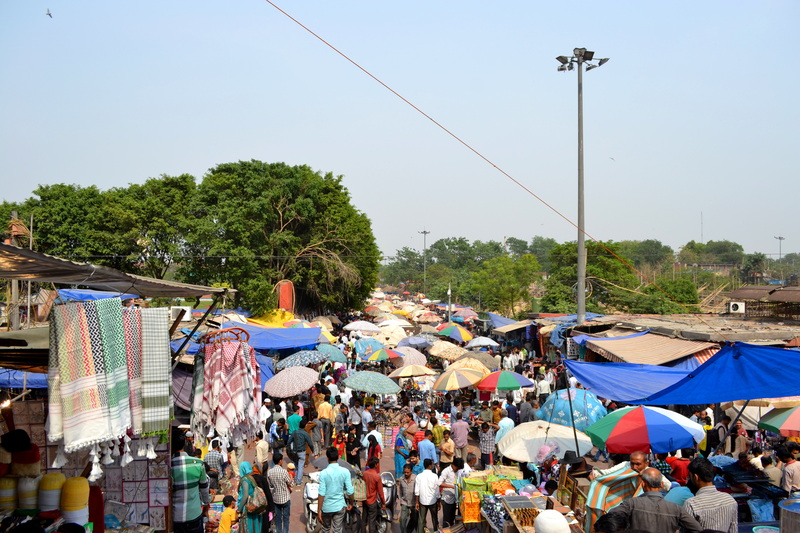 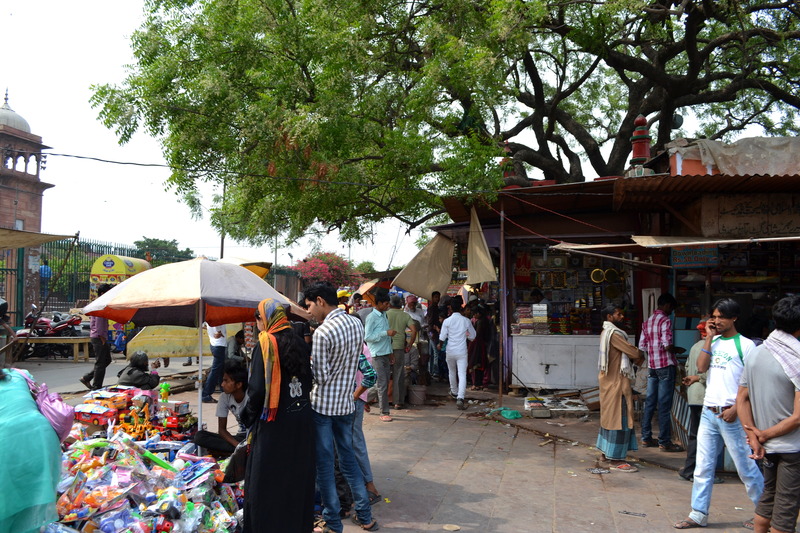 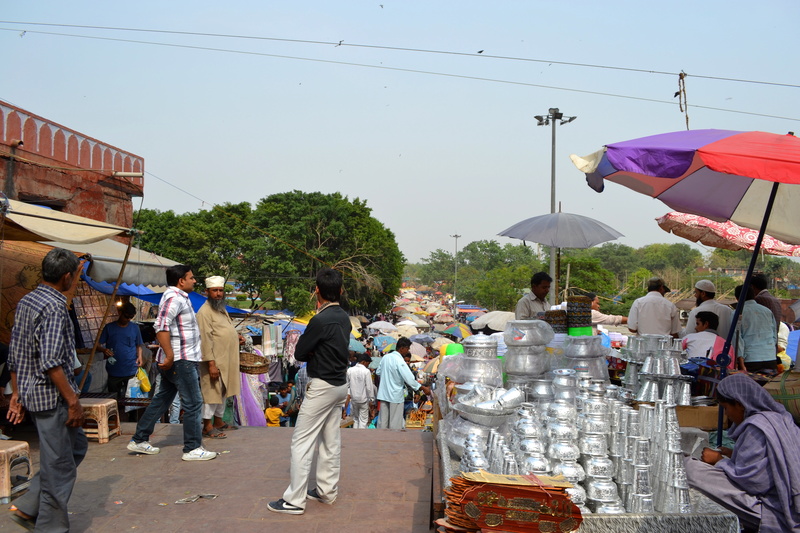 It is surrounded by a vast and sprawling bazaar, which fills up the labyrinthine streets made of compacted earth. 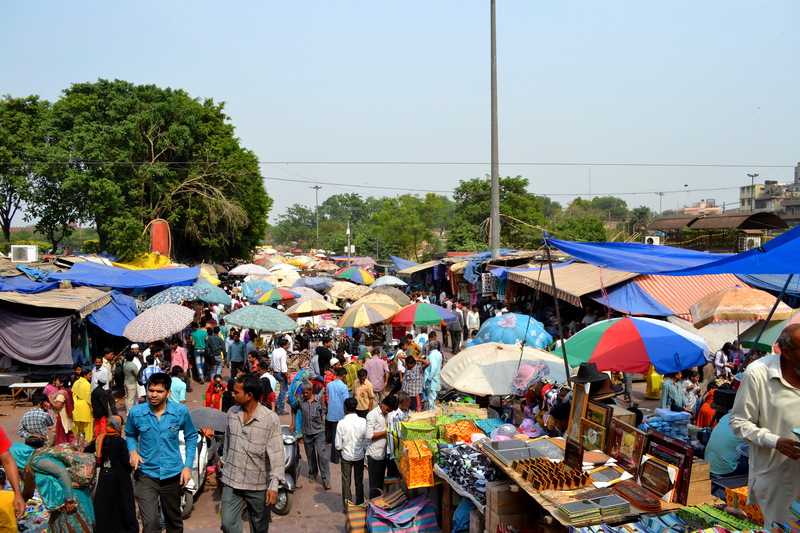 The bazaar is such a throbbing hive of activity that nobody notices us; they are too busy buying and selling, looking at wares, shouting their trade, or pedalling their bicycles through the crowds of people on foot. 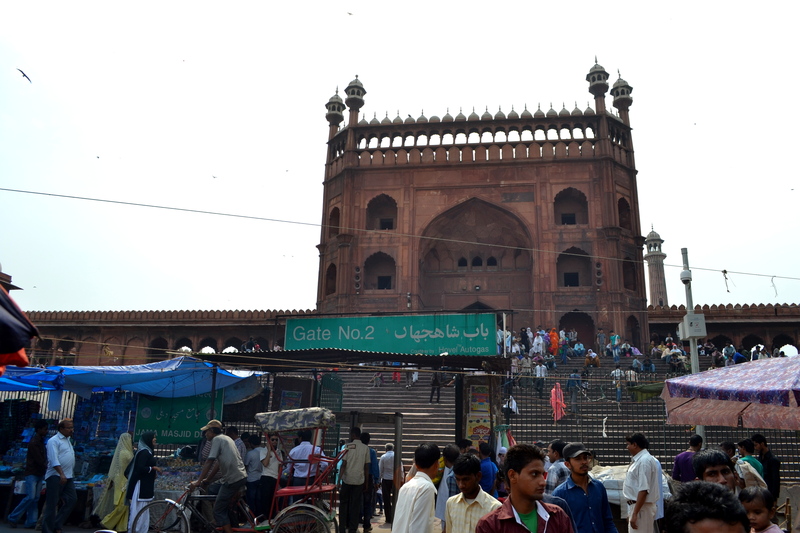 This is the main route towards the mosque, but we have some trouble finding our way. 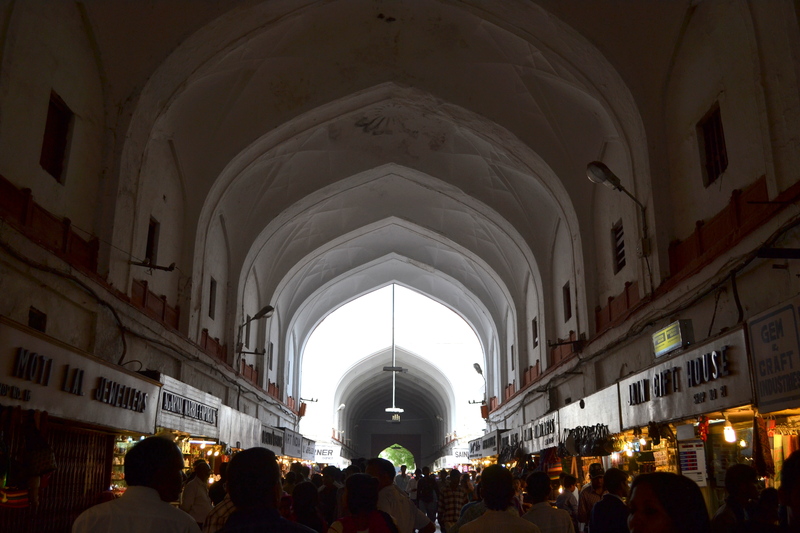 There are no signs, or obvious ways through the maze of market streets, and we navigate using our senses and guesswork. 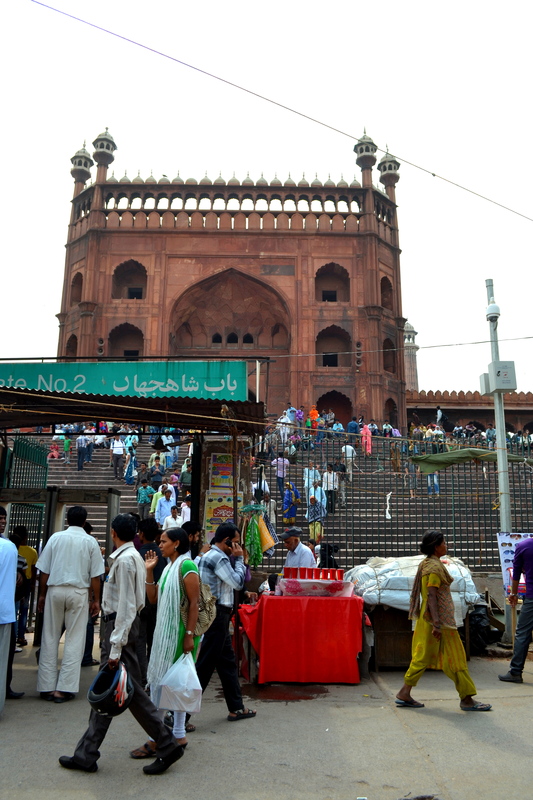 I buy a mosque cap from a stall on the steps up to the huge Jama Masjid. 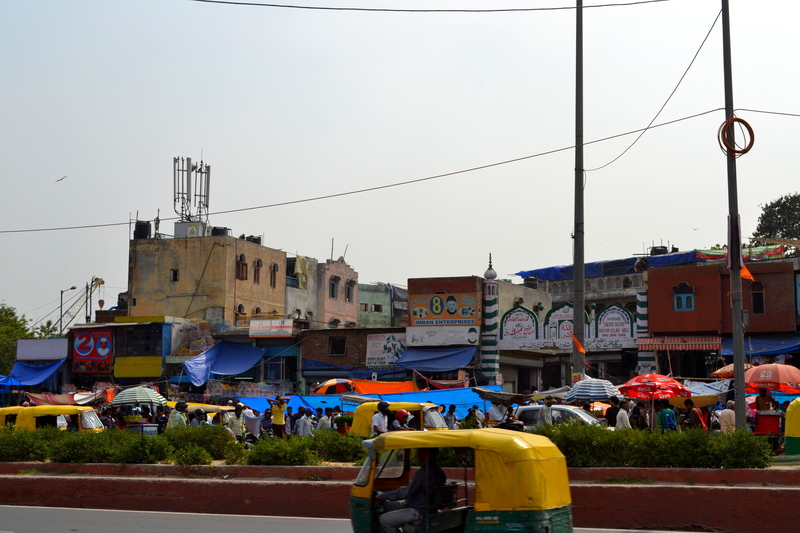 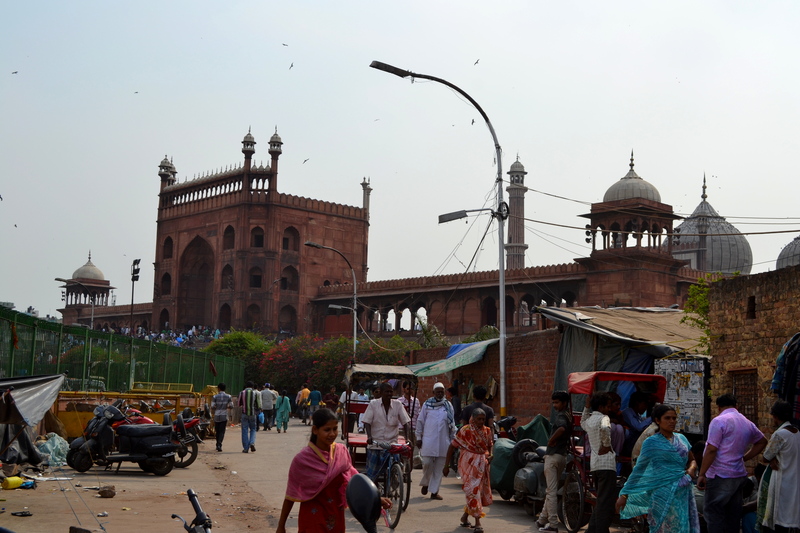 From the Jama Masjid bazaar we walk along to Red Fort (Lal Qi’lah), a sprawling Mughal fort in the heart of Old Delhi. 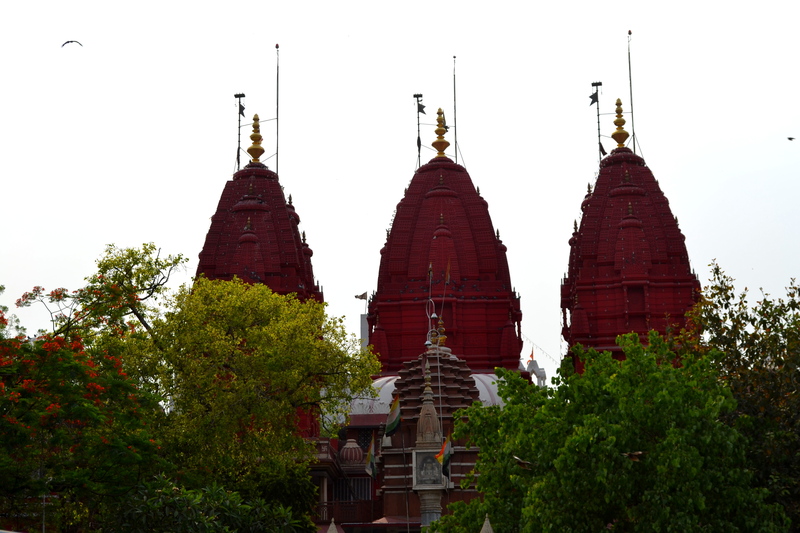 The Sri Digambar Jain Temple is the oldest and most famous Jain temple in Delhi. 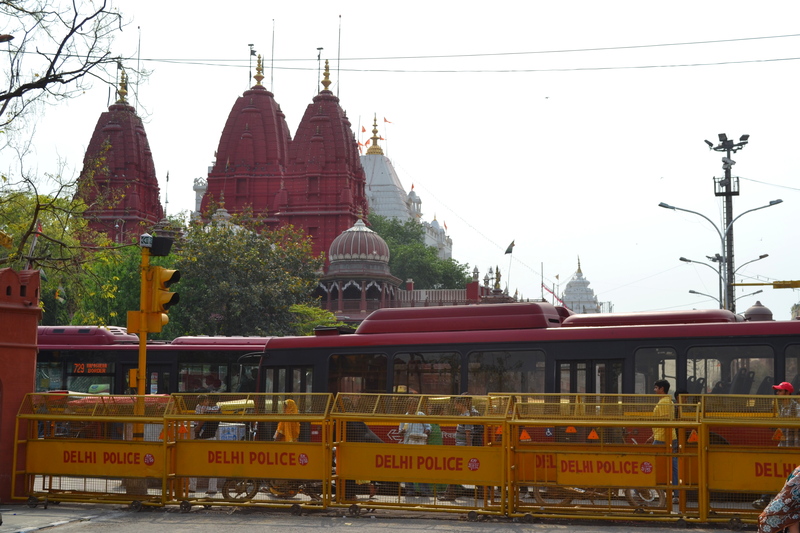 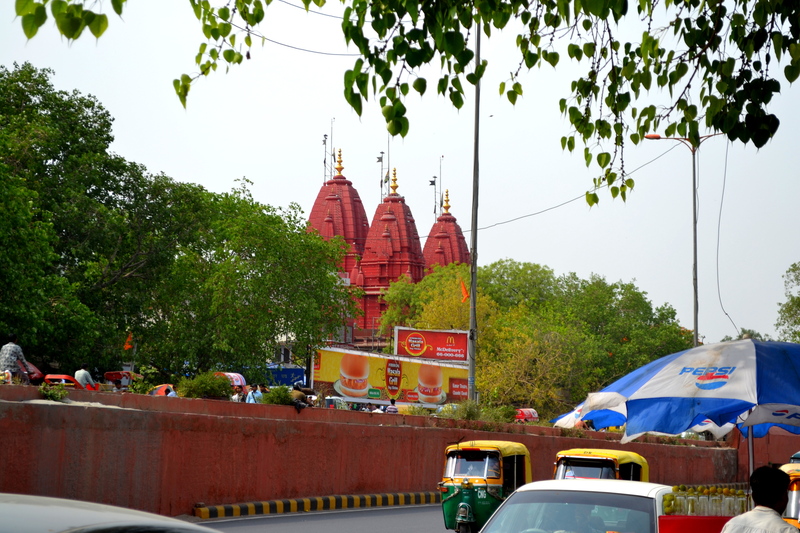 It is also known as Lal Mandir, meaning ‘Red Temple’. 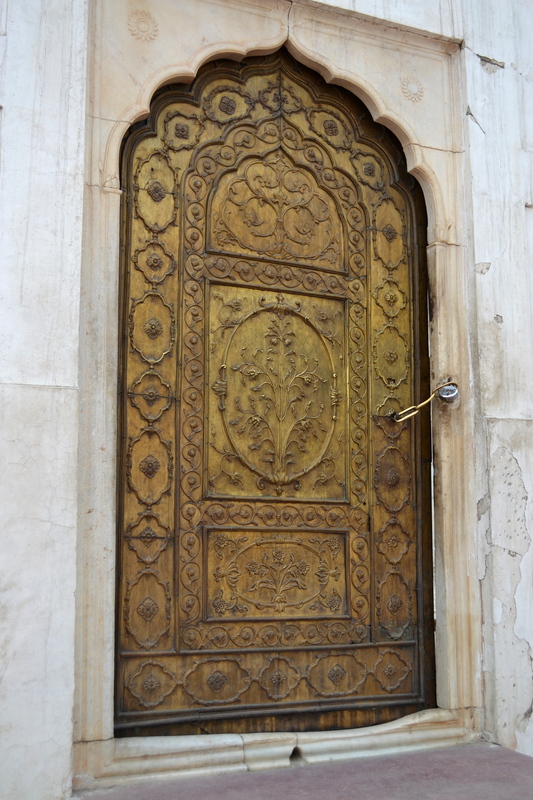 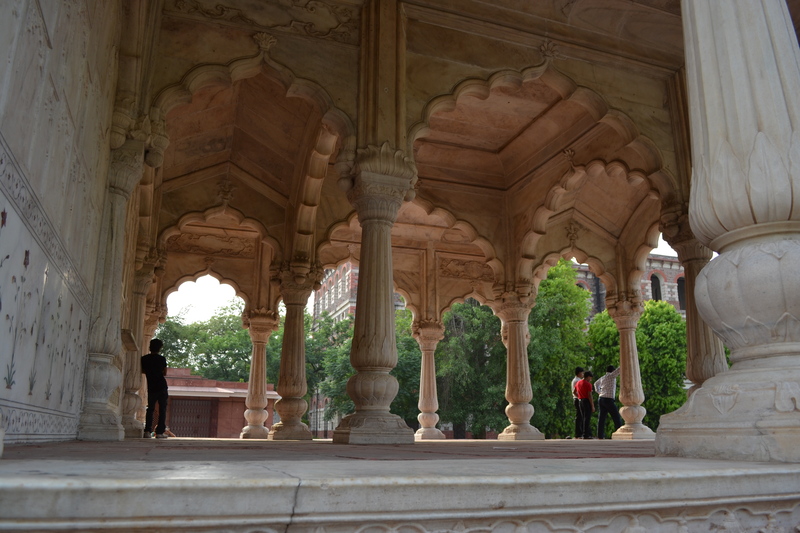 It lies opposite the Red Fort (Lal Qila), at Chandni Chowk in Old Delhi. 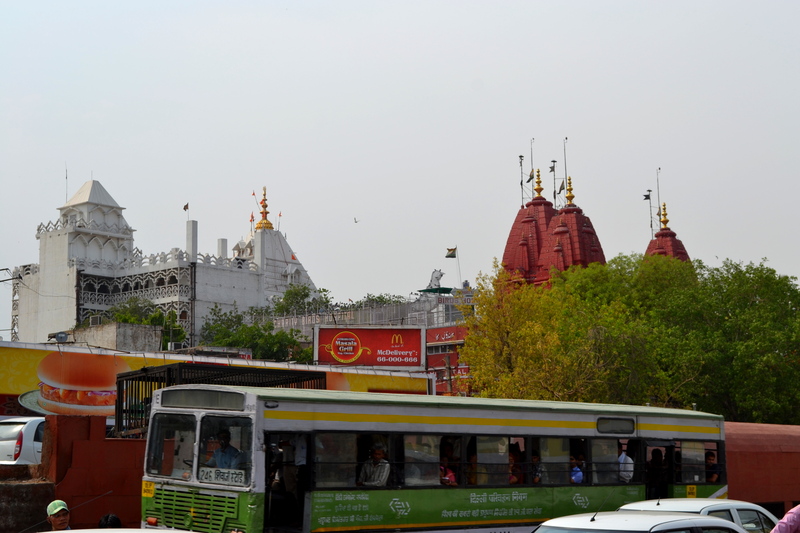 Below are some photographs of the Jain temple’s exterior and exquisite interior. 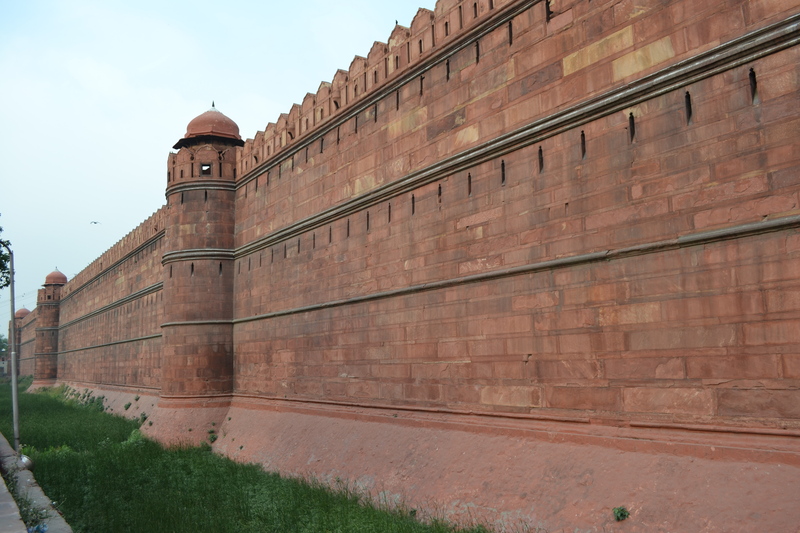 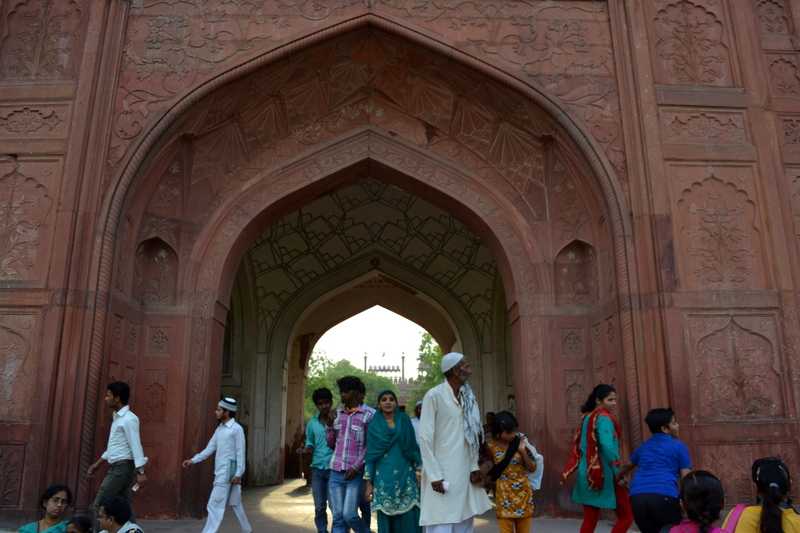 We enter Red Fort, a 17th century fort built of red sandstone. 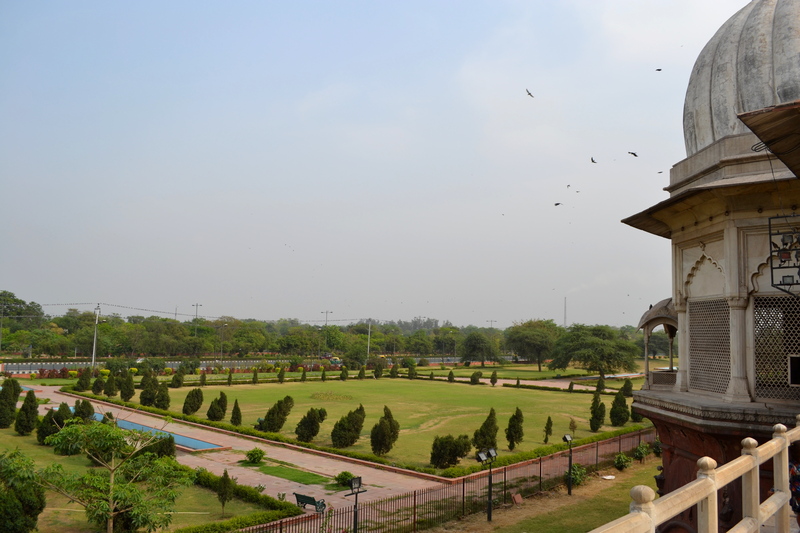 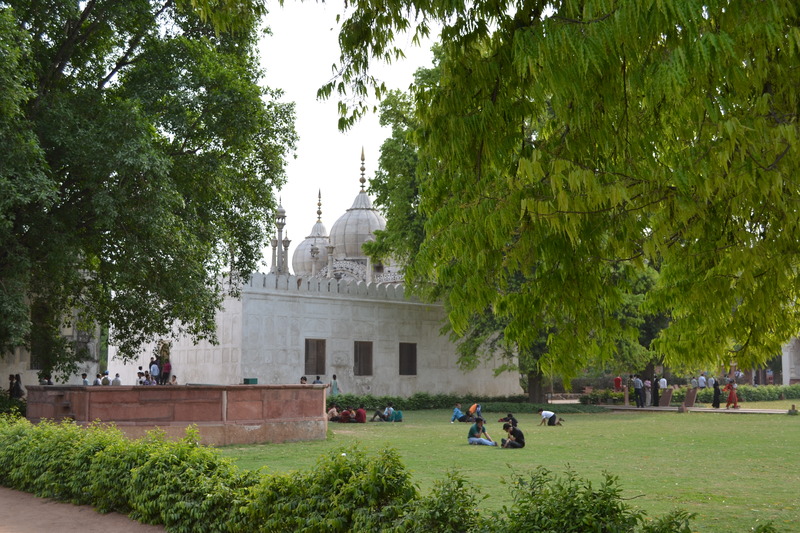 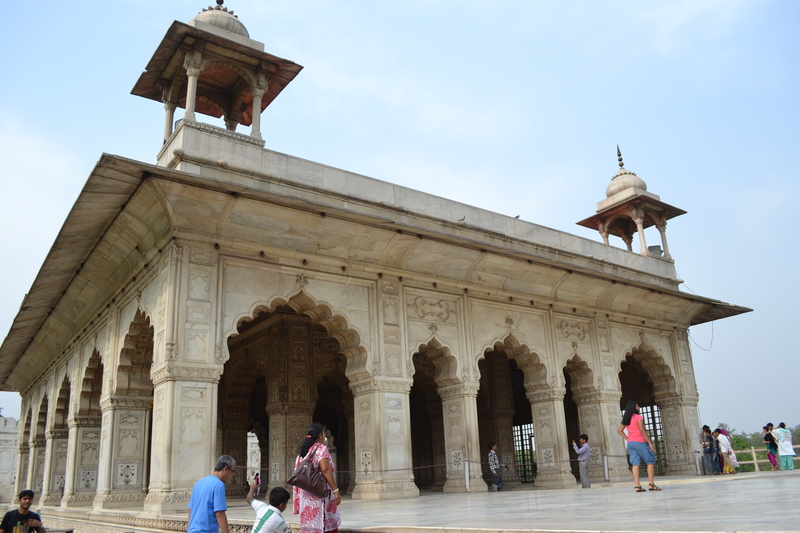 It was constructed by Mughal emperor Shah Jahan in 1638, when he moved the capital of his empire from Agra to Delhi. 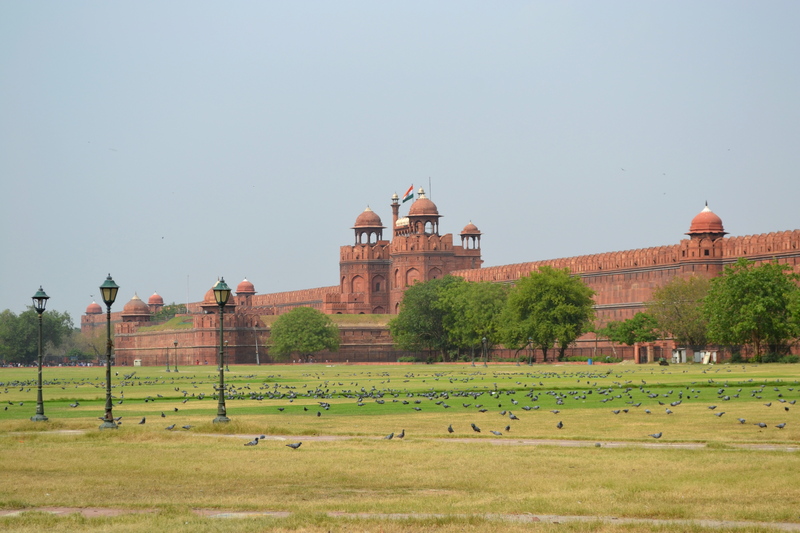 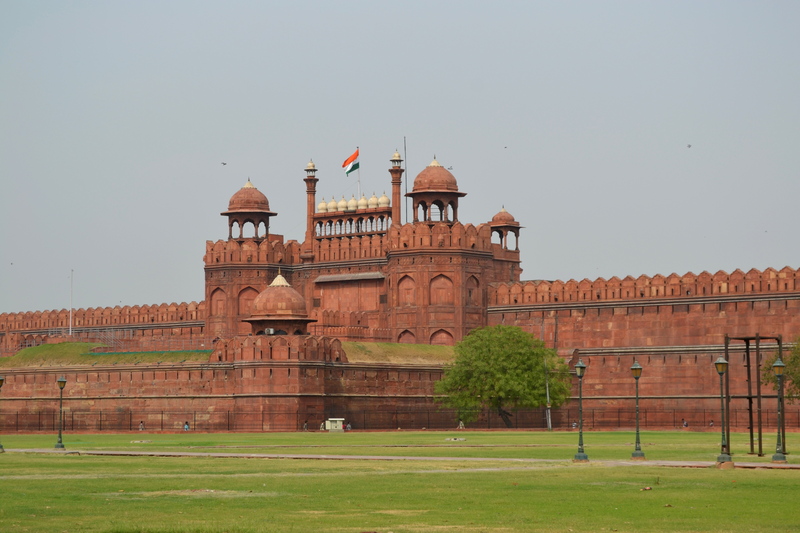 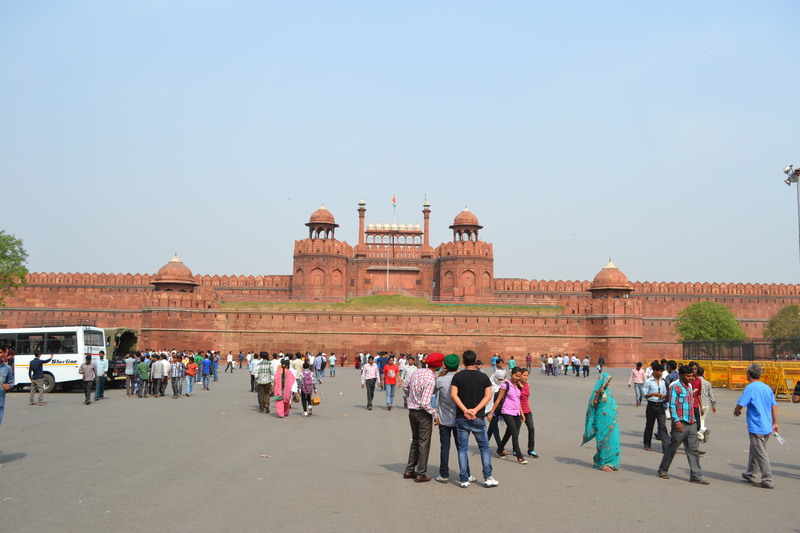 Red Fort is built, like Agra Fort and the Taj Mahal, along the banks of the Yamuna river. 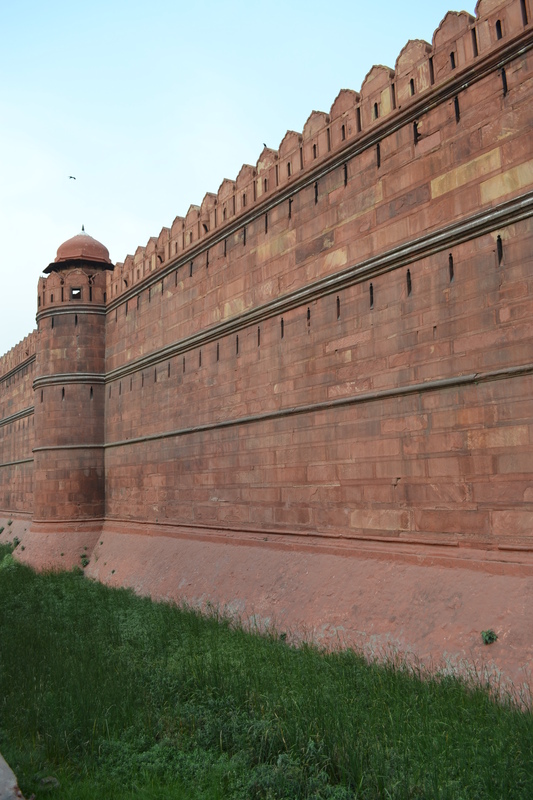 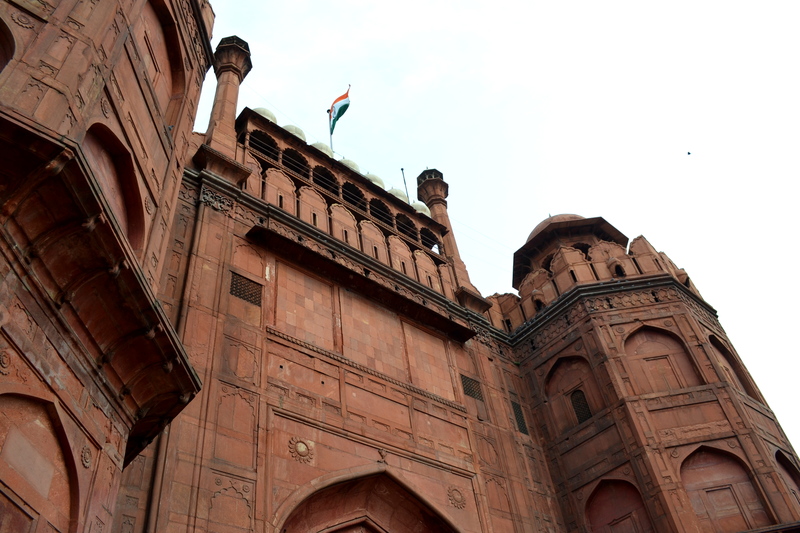 Like Agra Fort, Red Fort has many different palaces within it, and a range of varied and interesting architecture. 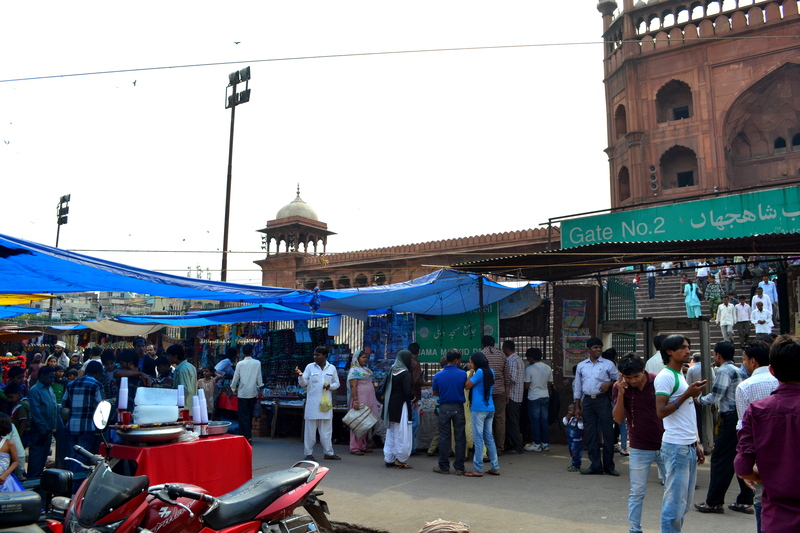 It was much more crowded than Agra though, perhaps because we were there at a weekend, and, strangely, given this, we also got much more attention. 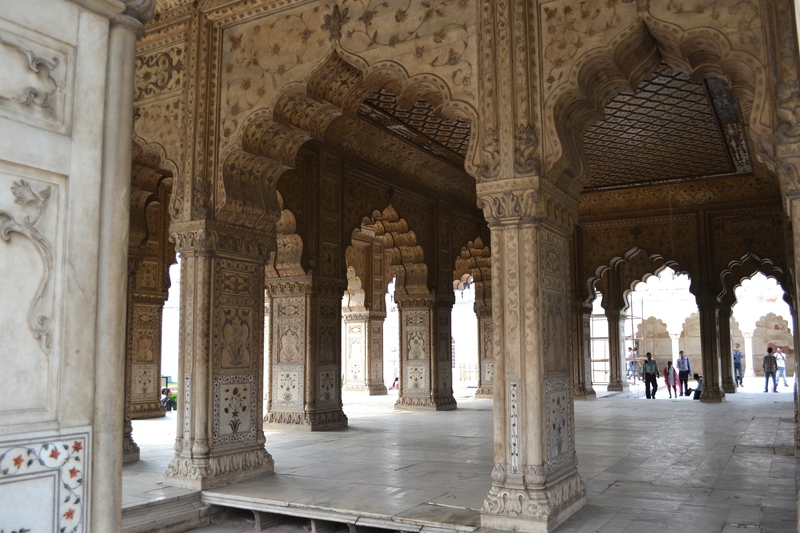 Perhaps we had been spoilt by visiting the brilliant Agra Fort first. 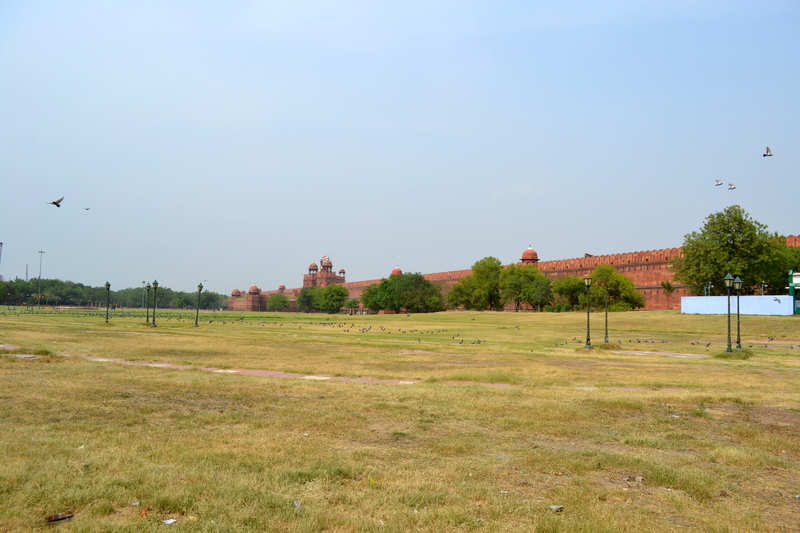 Red Fort is certainly vast, and interesting to wander around, but we all preferred Agra Fort, with its almost effortless and understated beauty. 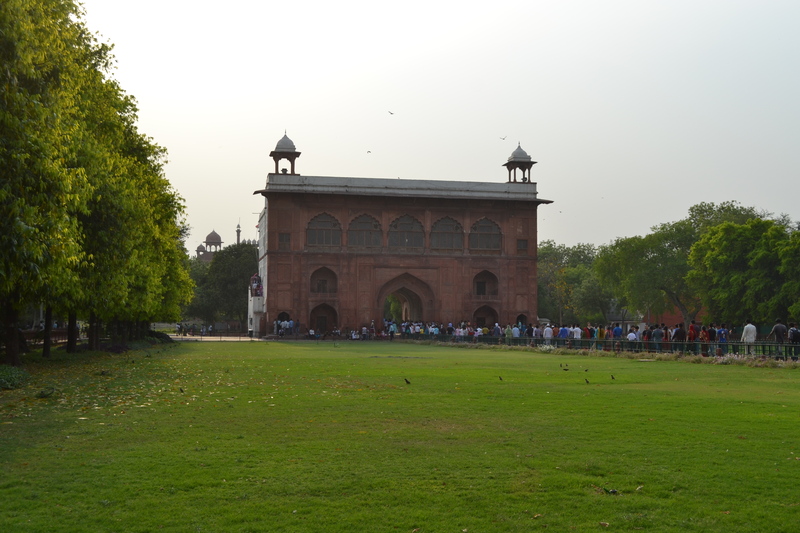 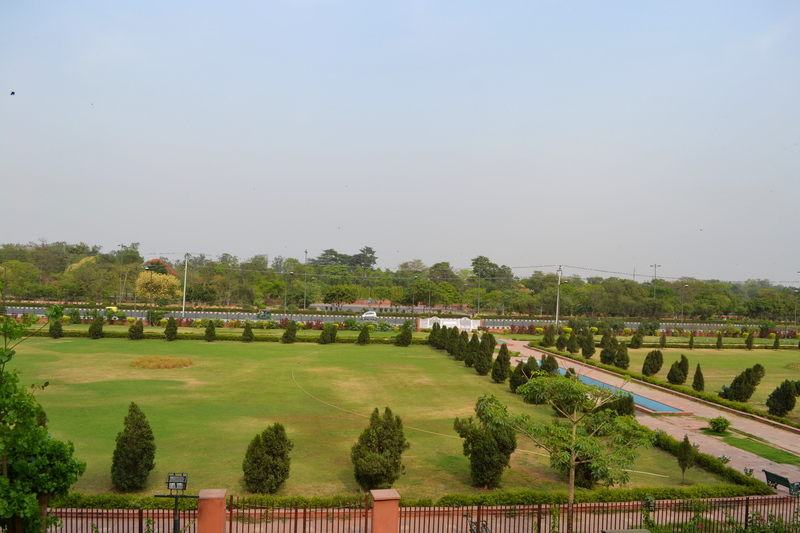 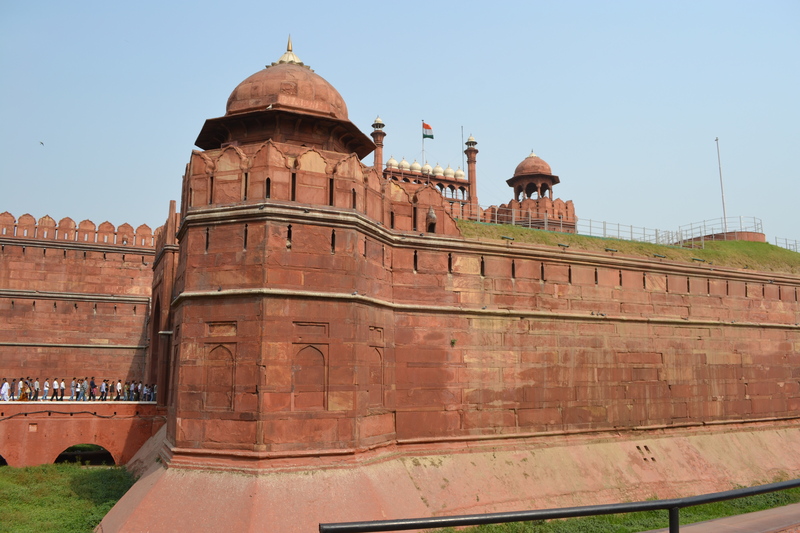 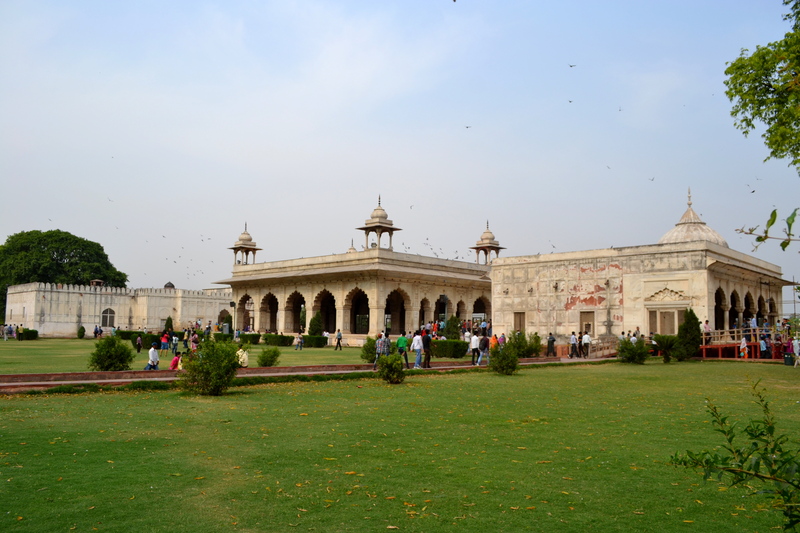 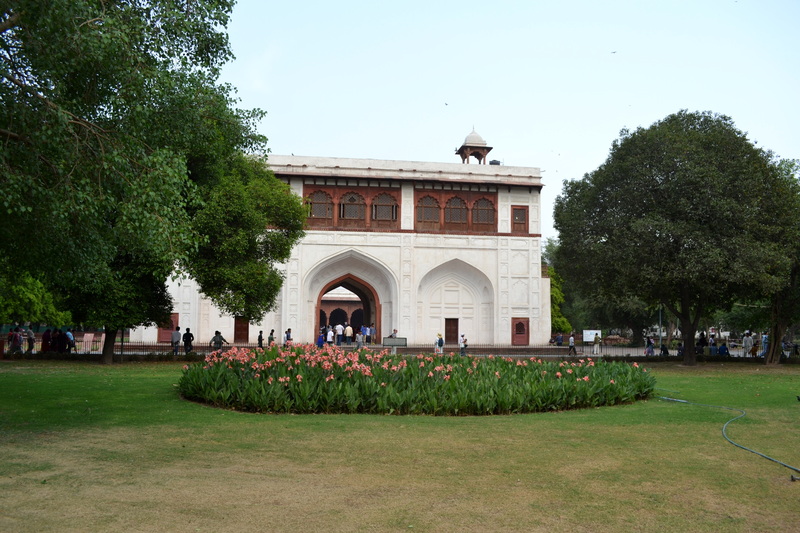 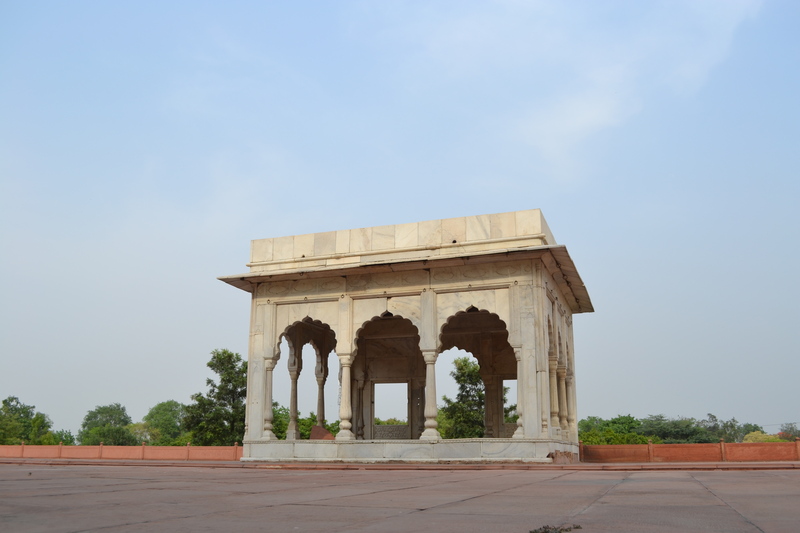 Below are more photographs showing some of the interesting and impressive components of Red Fort. 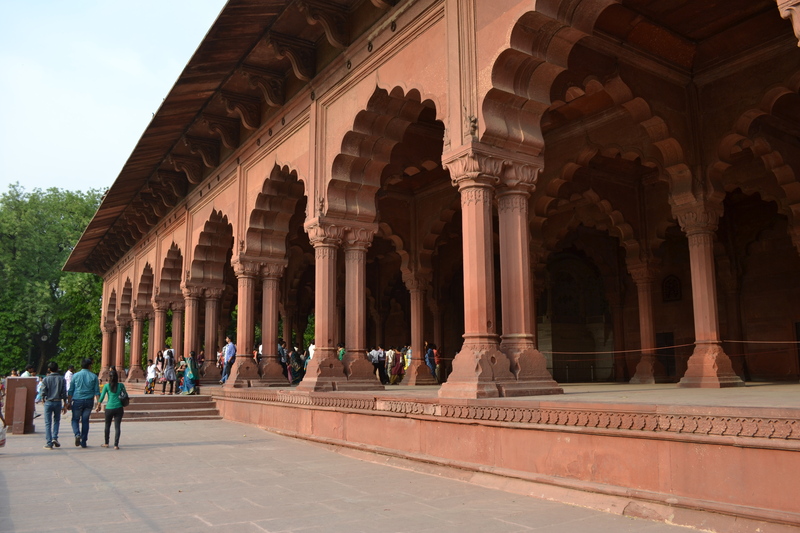 Have you read William Dalrymple’s City of Djinns? 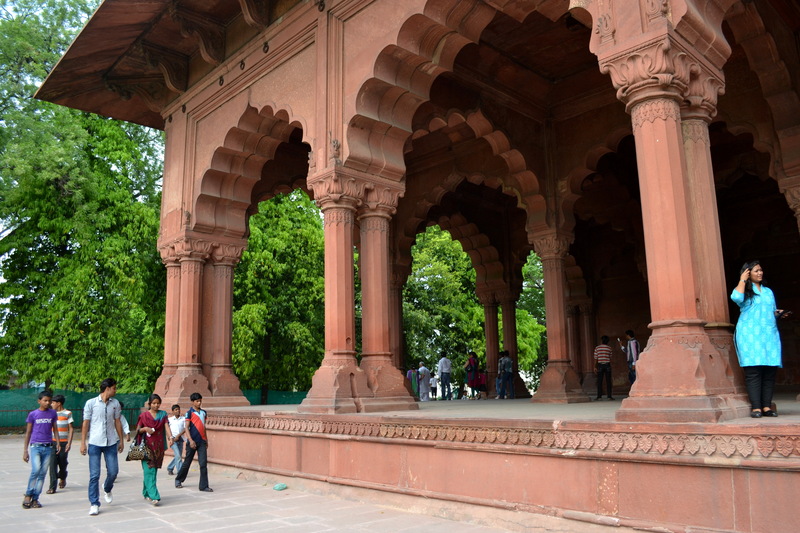 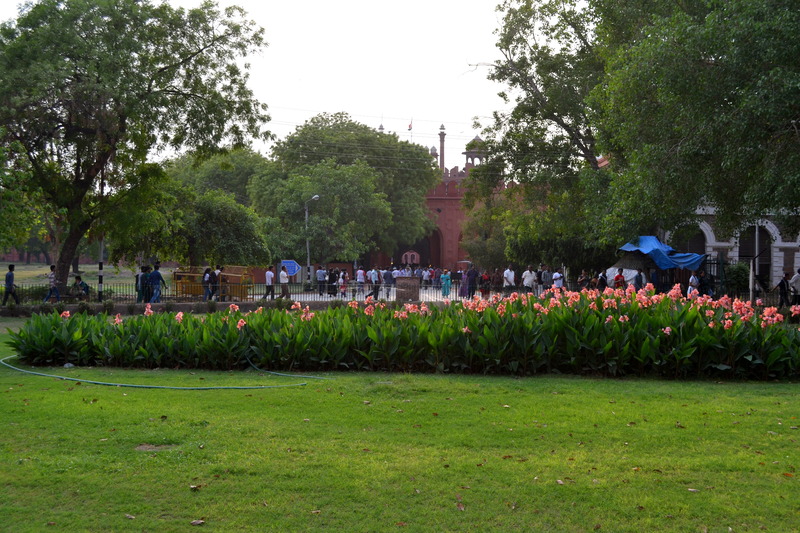 It’s great for taking you off the beaten track of things to explore in Delhi. 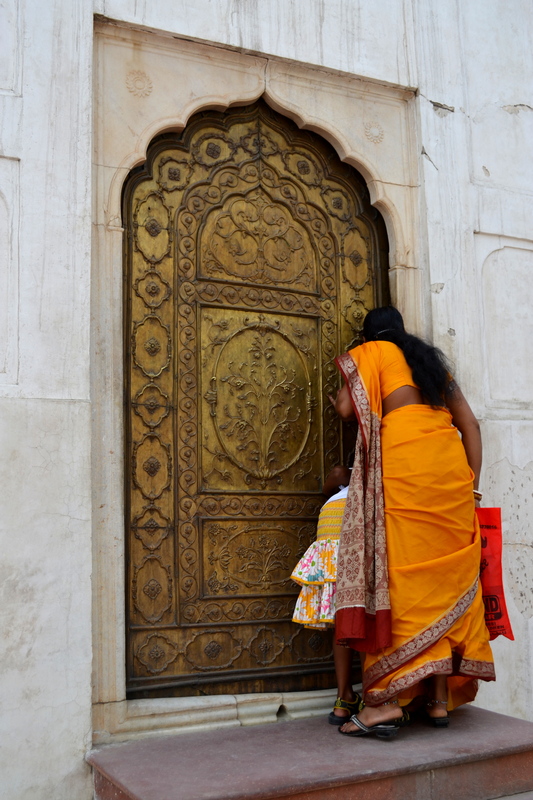 I haven’t, but it sounds very interesting – thank you for the recommendation! 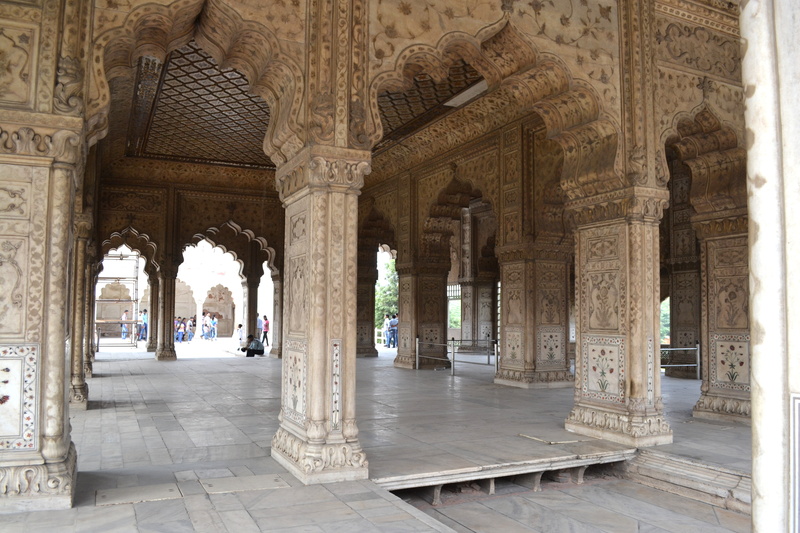 Btw, if you type in Delhi / Kashmir on my blog, you can find some India pictures I’ve post from past trips (in case you are interested). 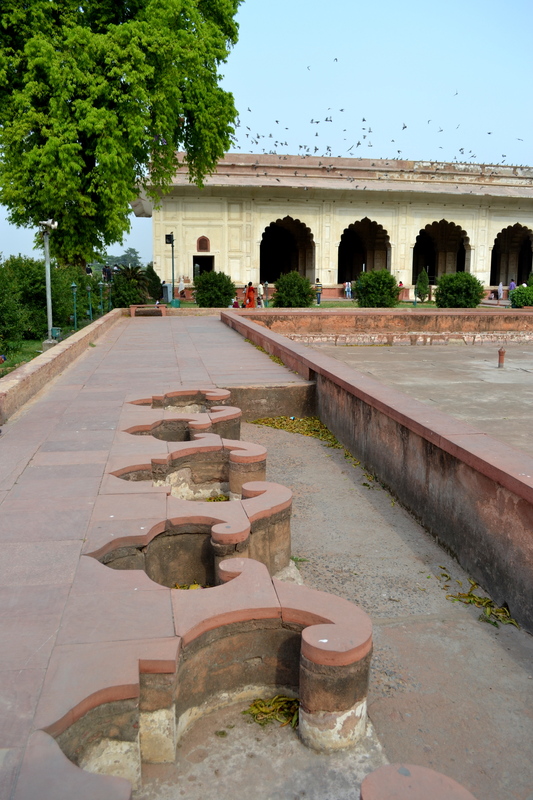 Thanks, I am interested yes – will have a look at those! 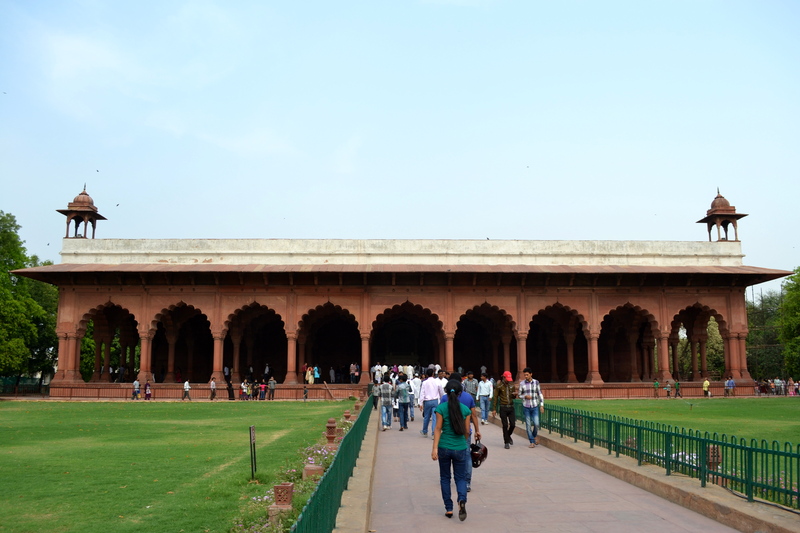 Unfortunately I was only in Delhi for a couple of days this first time, but I hope to visit again and have longer there to explore at some point. 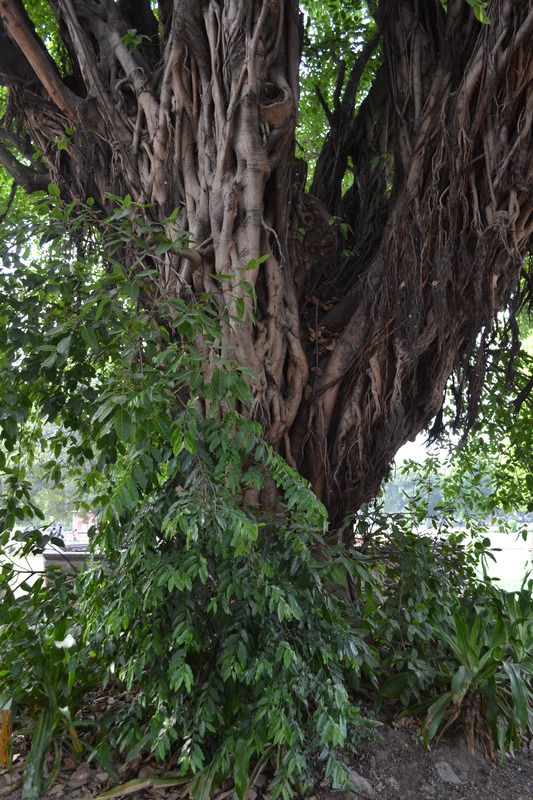 I have really been enjoying it, thank you! 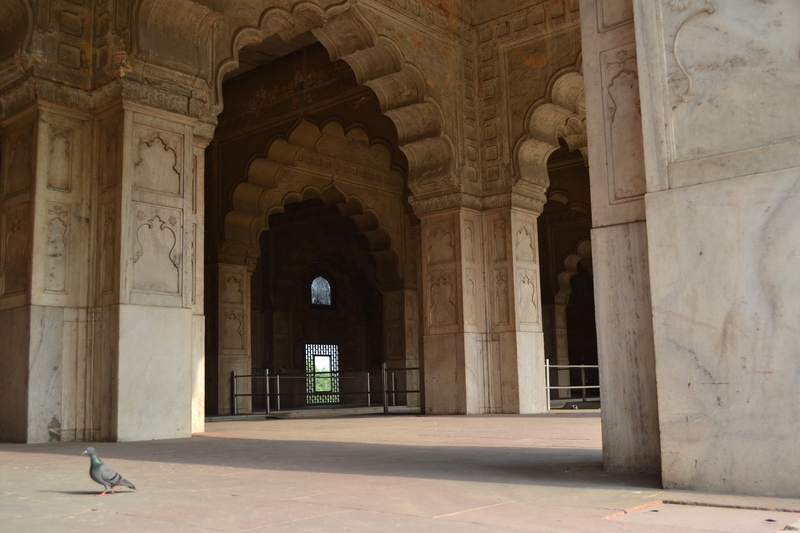 I am moving back to Britain in 2 weeks – but I don’t really want to leave India!